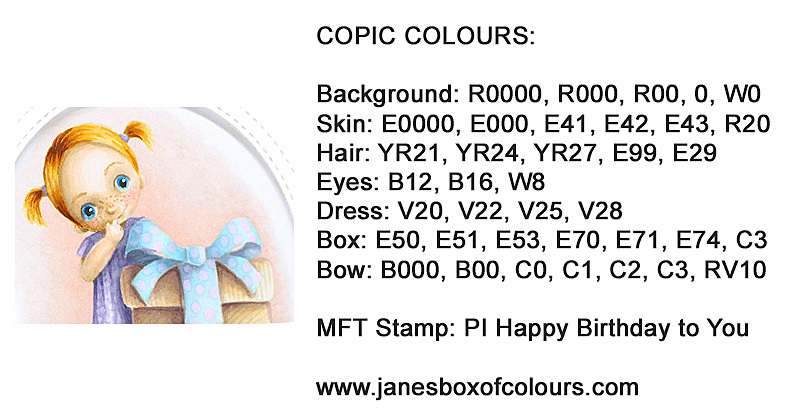 Back again with another cutie, this time from the Pure Innocence range, it's called Happy Birthday to you. It's almost time for you to go shopping! No surprises today, totally Copic, but it is the first time I've added eyes to the little Pure Innocence girl, what do you think? I opted to crop the image for my card - she stands beside a big box on the actual stamp. I mounted the Stitched Dome Frame with foam pads to give dimension to the card, but other than that I kept it pretty clean and simple. The sentiment was stamped with Versamark ink and then heat embossed with white embossing powder. Thanks for visiting today - I will be back on release day with more inspiration from My Favorite Things. Beautiful card. The eyes and eyebrows are a great addition. Brilliant ! Fabulous card with amazing coloring and additions of freckles and big eyes to the little girl along with modifies pigtails, and polka dot dress, and ribbon to match the base paper! Gorgeous, gorgeous coloring! Love your adorable card! Adorable card! I love her big blue eyes. So sweet, thanks for posting COPIC colors. Unbelievable. I become more impressed with your technique and talent with each post. Well done! I love your no line coloring.It makes everything look different! Great Release! CUTE card! I especially love your coloring! I love the way you changed the eyes! They completely changed the look of the stamp's face. The coloring is superb! What a cute card and use of background shading. Jane, what little girl wouldn't want to receive this birthday card?! It's adorable, so softly colored and cleverly framed. Thanks for sharing. What a difference in this little girl - love her!! Such a sweet card, love it. Hi Jane, I just came across this beautiful card and I was wondering if you made a tutorial for it and if so where I can find it? You are a awesome artist and colorist in my opinion and I thank you sharing this lovely card. Hello Necie, I am so happy you like my work. I have not created a tutorial for this card. I do however write a feature for the My Favorite Things blog called Artistic Expression. Each month I create a project and give a step by step guide as to how I created a particular element within it. I hope you find them helpful.